A “Mom Prom” is an ultimate girls’ night out – a chance for women and mothers 18 and older to get together and dance, eat, drink, talk, laugh, pose for pictures with their friends, relive some of their own glory days and make new memories with friends. It’s also a fun way to support an important cause because a portion the proceeds from each ticket will benefit a non-profit organization whose mission is to improve the health of women and children. Mom Proms are held across the country and by several of our ICAN Chapters. When and Where is Conference Mom Prom 2016? 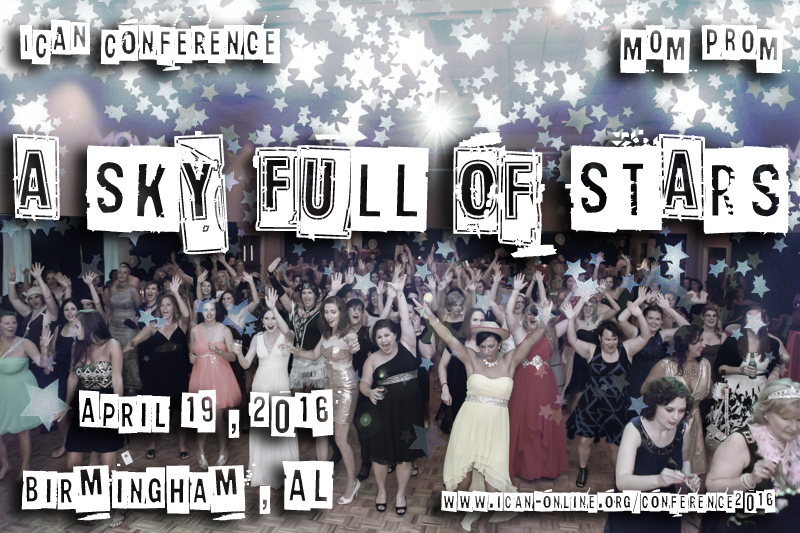 The Conference Mom Prom will be held Saturday April 9, 2016 at the Embassy Suites Birmingham – Hoover 2960 John Hawkins Pkwy, Hoover, AL, 35244 from 7-11:30 pm. Just in time to get your carriage home before it turns into a pumpkin! Or take the elevator straight up to your hotel room. Get your ticket now! Whatever you feel beautiful in. This is an opportunity to give those dance/prom/wedding dresses another spin around the dance floor or whatever is easy to pack. Please don’t feel obliged to buy something new; rock your favorite dress or t-shirt/jean combo if that is what makes you feel like a star. During conference, we are celebrating women and the bonds they share. Mom Prom is an extension of that; a chance to enjoy friendships both old and new! The event is a fundraiser for the International Cesarean Awareness Network (ICAN). Who’s Coming to Mom Prom? All women and mothers (18 years and older) are invited, but there will be no men allowed! Those attending the ICAN Conference and local women are all welcome to this fun event! **You do not have to attend conference to come to Mom Prom. A separate ticket can be purchased here. Tickets are $39 per person in advance thru March 31, 2016. Tickets are limited so make sure to get your tickets early! Ticket price includes admission, food, photo-booth access, and all the dancing your feet can stand! A cash bar will be available for your individual alcoholic beverage needs. Ladies usually spend this much or more on dinner and a movie on a typical girls’ night out. Come out and shine with us! For our fashionably late prom goers, prices will be $59 if tickets are still available. It is best to purchase tickets now before tickets sell out and you miss out on the fun! After purchasing your ticket, you will receive an email within 24 hours. We ask that you either print out the email attachment and bring it to the door with you when you arrive at the Conference Mom Prom OR show us your e-ticket upon arrival on your smart device. Additionally, we would ask that you also have a driver’s license or other state issued ID to prove ownership of this purchase and that you are over the age of 18 to attend, and 21 to buy alcoholic beverages at the cash bar. If you have purchased more than one ticket, please be sure that you complete a registration for each ticket to ensure prompt check-in the night of Conference Mom Prom. Each ticket holder must also present a driver’s license or other state issued ID, regardless of who purchased their ticket. What if something comes up after I buy my ticket? We really hope that doesn’t happen, but we are busy ladies and mamas and know that sometimes kids get sick at the least convenient times or life just happens. So if that happens to you, we encourage you to sell or give your ticket to another friend who would be able to attend in your place. Tickets are non refundable, but you are able to transfer them to someone else. Just send us an email at registration@ican-online.org to let us know who you have transferred your ticket to. I have a new baby and don’t know if I should leave her at home or bring her? Conference Mom Prom is an ultimate women’s night out. We think its best if you find a sitter or leave little ones with a trusted family member so that you can really enjoy yourself to the fullest! However, we understand when infants are very small and new it’s hard to be unattached. We leave this decision up to you, as you know your baby and whether they would snooze in your arms while you do the twist or if the tunes would be too much for your babe.